Free download xPhoto Advanced Photo Recovery latest version. Download this photo recovery program from high speed direct download link. xPhoto Advanced Photo Recovery is available to try free. 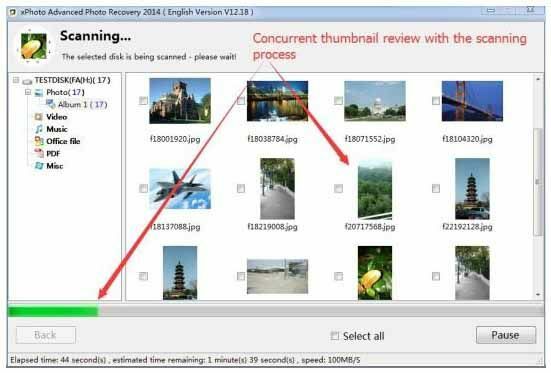 Easy to Use: xPhoto walks you through a step by step wizard, you don’t need any special IT technology to complete the whole recovery process. Flexible: xPhoto provides 2 recovery modes. You can choose the mode which best fits your data loss problems. Safe: xPhoto is a read-only utility, it doesn’t write any data into the media you tried to recover data from. xPhoto will prevent you from saving the recovered data into the disk you scanned. Fast: xPhoto features some cutting edge technologies to overcome the disk I/O bottleneck. Those cutting edge technologies speed up the recovery several times. We have once compared xReovery with another famous data recovery softare. For a 7.5 GB disk, xPhoto takes only 3.5 minutes to complete the scan process, while the compared one takes almost 6 minutes. User-friendly: most data recovery software provides data preview functions, however, those features won’t be available until the whole scan process is finished. That means, if you have a several hundred gigabyte disk to recover data from, you have to wait several hours to see the result. xPhoto invents an amazing technology overcome it , every time the scan process finds a file, you can immediately view the file concurrently with the scan process. This feature makes sense if the files you wanted are in the very beginning of a big disk. If you data is in the begging part of a disk, you don’t need to wait the whole process to complete, you just need to click the pause button and then save the data you want. This feature saves you a lot of time, and makes the recovery not boring any more. Amazing built-in photo viewer: xPhoto has an excellent built-in photo viewer. Unlike the photo viewer of other data recovery software, xPhoto built-in photo viewer window can be resized. This feature is very useful when you view a big photo, you don’t need to use the scroll bar to view the photo as you do with the fixed size viewer of other recovery utilities. Besides that, xPhoto built-in photo viewer is much more convenient than others. With others, you have to close the viewer then click the next one, this is a big problem if you want to view hundreds of photo. xPhoto’s built-in photo viewer has 2 buttons(previous and next), you don’t need to repeat the close-open action, you just need to click previous or next button.